Almost seven years ago I made the then difficult drive to the Mayto area south of Puerto Vallarta. It was love at first sight and the beginning of an amazing project. I found a very special parcel of land fronting the Pacific Ocean, with multiple building sites and breathtaking views of the ocean and beach. I call the place Chachalaka after a native bird. Today, I am nearing completion of a modern, eco-smart house on this land. Many people have asked me how I did this and after seeing it, they certainly know why. The first and most important piece is securing the true title to the land, once you have negotiated a deal with the owner. Acquiring land in Mexico, in many areas, usually means you are dealing with Ejido land. This was the case for me, and it is a process that requires patience and a great deal of effort on the part of the seller, as well as the buyer. Basically you are taking land out of Mexico’s “homestead” system and “privatizing” it. It is a process most sellers and buyers know very little about, so there is potential for misinformation along the way. 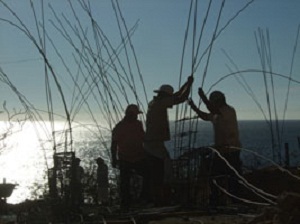 The “Ejido”, which is a legal governing body of a community, plays a large part in the transaction. The leadership of the Ejido authorizes the sale, signs documents releasing the land, and gets a commission. Needless to say, a good attorney who knows about this type of land is important to have on your team. I chose to be sure that I had legal ownership before starting anything. This took almost three years. Some jump right in without papers, something I would recommend against. The second, and fun part begins when you put in infrastructure to support development and start the design process. I might add, that most everything you do requires permits, and in some cases you deal with both local and Federal regulations. My vision is for multiple homes, however I am focused on one home at the moment. This is a modern, sustainable, eco-smart house that I designed for today’s lifestyle of modern coastal living. I also believe it supports a concept of minimum environmental impact on the land. I have a great team running the construction. I think it is important to really know your contractor. We spent six years getting acquainted. This has paid off. I am in an area that some would consider logistically difficult. 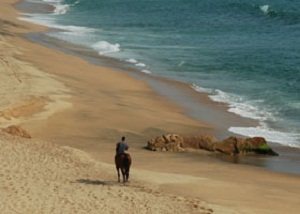 And, that is why it so special, a place of pristine endless beaches. 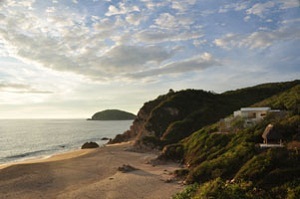 It is a perfect hideaway with smart design, architecture and beach, less than two hours from Puerto Vallarta.